Inspired Self-Help Group Welcomes You to Reality Change! You To Change Your Reality! Throughout this webpage inspired self-help group is defined as a particular group of people who have come to know certain truths concerning the nature of existence. Through their internal inquiries and external research they have remembered much self-empowering knowledge. And because they know they’re able to pass on that truth, knowledge and remembering to others who also want to know. To be clear though, it’s not that because they know that people from this inspired group necessarily feel as though they must or need to share what they know with others, but rather due to their naturally higher vibrational state of being, they can’t fail to reflect what they know to others. That is to say, through the action of simply being themselves their vibrational state of being emanates their truth for others to receive. For anyone who wants to know, this webpage examines certain aspects concerning the nature of reality and of existence itself. This information is truly helpful when inquiring into the truth of who you really are and how to change and improve your life experience. Think of this information as coming from members of an inspired self-help group of people who already know and who thus then, can’t fail to reflect what they know to anyone with the willingness to tune in. Once we’ve realized (remembered) that everything came forth from spiritual reality and as such it always remains spiritual at its core (it can never really be separate), then we realize that the most self-empowering way of viewing reality and life on earth is from the higher frequency perspective of spiritual reality. Spiritual reality can be explained and perhaps better understood through the ideas and concepts contained within the science of metaphysics (to use a word). Thus, by using the principles of metaphysics in our daily life any so-called problem or challenge can be understood and then turned around and redefined into something that serves us better. Think about how your current experience of reality came about. Did it just happen all by itself or did you have a hand in creating it through your own definitions, imagination and beliefs? And isn’t it true that at some point you offered positive or negative emotion towards your reality, thus causing manifestation of your current experience? Understanding how your reality became your reality is primary before moving on to the idea of changing your reality. Look around you. Whatever reality you see is the experience of reality you’ve created for yourself. Understand that you are 100% responsible for your reality. No one else created your current experience of reality for you. Unless of course you agreed to allow them to do so by buying into their ideas about reality and thus handing your power over to them on a plate, but you are still responsible for that! Now that you’ve remembered that you created (by choosing) your current reality through the thoughts, beliefs and emotions that make up your vibrational state of being. Now it's time to get clear about what you do prefer and what you don’t prefer. Up to this point your life experience probably contains a mix of things you prefer and things you don’t prefer. Now is the time to clarify what you’re up for and not up for. This is conscious deliberate reality creation. Why continue holding on to things that you no longer prefer to have in your life experience? The universe, your Universe, is impersonal and it only has the ability to reflect back to you the things, ideas and people that you focus upon aka your vibrational state of being. That is to say, your attention to both wanted and unwanted things, ideas and people creates your vibrational state of being, so that’s the reflection that gets generated as your reality. Now is the time to change your mind about some things. Now is the time to decide and to declare to the Universe: who, what and where you now prefer to experience. Just because someone’s been your friend for 30 years it doesn’t mean you have to remain friends if that friendship is no longer serving you! Just because you’ve worked in a job you hate for 20 years it doesn’t mean that you can’t leave it and choose to do a job you love. Just because you’ve always lived close to friends and family it doesn’t mean that you shouldn’t move to a place that’s calling you, indeed, moving may be exactly what will best serve you at this timing. Considering that your perspective of this NOW moment always leads to another very similar perspective of this NOW moment, if you’re not happy in this particular NOW moment - when will you be happy? Think about it. Relax your mind and then consider and feel what it is that brings you joy, what excites you the most? If you had a choice, what work would you do and where would you live and who’d be your friends? My friend, you always have a choice! The point is that this is YOUR life experience so how you live it is always up to you; it is always your choice. There is never any judgment of your choices, not really, because there is no judge outside of you! If you’re happy in all areas of your life then you’re having a joyous life experience, congratulations. However, if joy is absent from your life always remember that you do have a choice and you can redefine and change your life at any time! Within the idea of the one eternal moment of NOW everything that IS is happening NOW. Therefore, in truth, there’s no past or future, there are only different perspectives of the one eternal NOW moment. Thus then, logically and obviously all realities already exist, so creating reality is, really, choosing reality! All reality exists within the eternal moment of NOW - which reality do you now choose to experience? To realize that all possible and all probable realities exist NOW is to realize that, by definition, all probable realities exist HERE and thus all probable realities are available for us to choose to experience right NOW in this moment. That is to say, every choice you make means that you are either choosing this or that parallel reality. What limits our ability to experience our preferred probable parallel reality is our ability to believe fully that: yes, because I create my own reality as I go along it’s only my own belief that’s either bringing that reality to me or holding it away from me. Your belief in any reality is like a rudder that steers a ship, in the sense that this belief turns your ship right and that belief turns your ship left. Read this inspired self help goals page for a more in depth look at the nature of paradox. 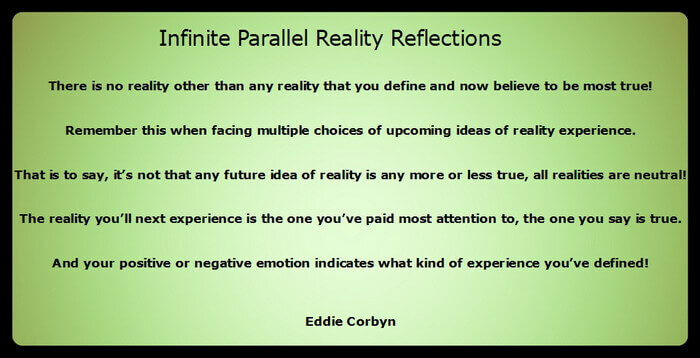 Understanding the idea of parallel realities will assist you to realize that reality creation is really about you choosing a newly preferred yet already existing perspective of NOW, but can you believe that? Can you believe that you’ll create your new experience of reality by realizing and then believing that your new reality already exists NOW? Belief in and of any preferred reality is the catalyst that will bring about the desired change in perspective. That’s how we change our perspective and how we move from one version of reality to another. However, if you don’t believe it then you won’t allow yourself to experience it, that’s the nature of how belief works in our "Belief Driven Universe!" Due to the eternal moment of NOW always existing, all possible and probable parallel realities always exist exactly as they are NOW. This is because there’s no movement, in the sense of chronological or linear time, in which change of any sort can take place. Therefore, what we experience as change is us (consciousness) moving through a series of static images or frames of reality all contained within the idea of NOW. What we call "time" is an artificial construct that’s created by our consciousness in order that we can experience the illusion of change and movement through space. However, in truth, creation is already finished and thus all realities are always fixed and unchanging. The only thing that actually changes is our experience of reality as we (as consciousness) view one image after another at near infinite speed. That is to say, reality change isn't real, but our experience of the change is real. We experience the individual pictures or frames of reality thousands of times per second. This "effect" creates the illusion of movement and change. Perhaps five hundred years ago these kinds of people believed that the world was flat (some people still do). That’s their right and so it will be their experience. However, if the information in this inspired website resonates with you realize that you are a part of the inspired self-help group. It's not about being better or worse, it's about vibration. You are on the leading edge of "New Thought" and by holding these ideas within your consciousness you’ll attract confirmation from others within this inspired group. The inspired self-help group of people I refer to have at least begun to realize that they are more than merely a physical being or a meat suit. Many of these spiritually aware people have realized that a big part of their mind, their higher self, resides in non-physical reality and that they have an inseparable connection to it. The more the inspired group of people believe this, the stronger or more apparent their connection becomes. And once they’ve learned to quiet their physical mind or ego-self personality construct even more, then the more the information from their higher spiritual self is recognized and acted upon. This is inspired knowledge and action. Decide and define what kind of world you want to live in, then imagine, believe and feel it into your NOW experience. And then act as if you’re already experiencing that world and before long you will be. Because I now choose to live in a world in which everybody does whatever they do with love, that’s what I’m imagining. This inspired self help test page goes into the details of the idea of the kind of Earth I prefer! Far too many people are too hasty in giving up on what they desire from life, the life they’re imagining or dreaming into existence. We’ve come to this space-time reality in order to experience the process of change through linear time, so what’s the hurry? Everything happens in perfect timing, but not in the "time frame" demanded by your ego! That is to say, the more worry, doubt and stress generated by your ego, the longer the desired change will take! That's right! Remember that you always get whatever you focus upon most, be it wanted or unwanted, so focusing upon the absence of what's wanted can only serve to delay it. Knowing this, why not simply remain focused within the present moment in a happy and feel good state while watching the change as it occurs in real-time, right before your eyes? That is to say, why not simply relax and savor the in-the-moment reflections that your higher self and your Universe are bringing to you? 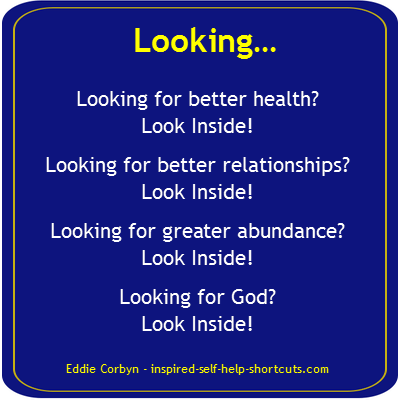 Click this image to get a FREE PDF document containing a very powerful list of Inspired Self-Help Group Reality Check Keys. Once the new window has opened up you can read the document or save the file to your computer. Enjoy. As physical beings we’re experiencing moving through infinite reality images called forth by our own imagination, that’s physical life experience in this 3D/4D reality. But upon the death of our physical body what remains? What remains is what has always been there, our spiritual being or soul the core of who we really are. Earth is but one of a myriad of infinite possible realities. In the same way that we as physical beings move through life on earth, our non-physical being or soul moves through countless and endless physical and non-physical realities. Our soul projects a piece of itself into any reality for the purpose of the exploration of infinity. People who haven’t started their journey of self-discovery primarily function from the ego state. And for people who’re vibrating at a higher frequency that’s no longer very attractive. Once we’re aligned with our higher spiritual self we naturally want to meet and know other spiritually aware people. There’s no judgment in that, it’s about vibrational resonance. Over the past few years I’ve met more and more spiritually aware people. Each time I meet these kinds of people I’ve noticed that reciprocal healing, insights and understanding takes place. These kinds of people have inquired within and have helped themselves so I refer to them as an inspired self-help group of people.